Recovery may be the most overlooked aspect of our exercise routine. Everyone seems to focus on how long they should run/ bike or at what heart rate zone they should be in while exercising. Improvements in fitness, however, occur during the recovery period between exercise sessions and not during the exercise itself. When you finish a cardio or weight training session, you are weaker, not stronger! How much weaker depends on the intensity of the workout sessions. If the workload is too great and you don’t recover before the next workout, your ability to perform during subsequent workouts declines. Therefore, what you do the rest of the day when you are not exercising is just as important as what you do when you are exercising. 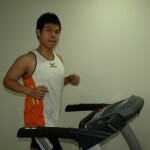 The faster and more complete your recovery, the more you will get out of your exercise programs and training sessions. Between working out over the lunch hour and having to rush back to the office, it’s easy for you to not eat after your workout session. Not refueling after exercise, especially after long or intense duration, is possibly the single worst thing you can do to slow down recovery. The most important aspect of optimal recovery from hard workouts is refueling nutrient-depleted muscles. Refueling after workouts is important for several reasons including the replenishment of fuel stores and the repair of muscle fiber damage. In regards to fuel, carbohydrates are the most important nutrient to replenish. It has been known that exercise performance is strongly influenced by the amount of pre-exercise muscle glycogen and that intense endurance exercise decreases muscle glycogen in the body. To maximize the rate of glycogen replacement, you should consume simple carbohydrates (sugar, preferably glucose) within 30 minutes after your workout. It would be even better if you can eat or drink more often, since a more frequent consumption of smaller amounts of carbohydrates better maintains blood glucose and insulin levels. Regarding muscle fiber repair, protein is another important nutrient to consume after hard and long workouts, especially when trying to build lean muscle. To repair muscle fibers that are damaged during training, you have to consume complete protein (those which contain all essential amino acids) after their workout. Some studies have found that eating protein and carbohydrates together also maximizes muscle glycogen storage. Since nutrients from fluids are absorbed more quickly than from solid foods, you should initially consume carbohydrates from fluids. Other than the common sports drinks we can easily find, any beverage that contains a large amount of carbohydrates will be great for recovery. For example, chocolate milk, which has a high carbohydrate and protein content, is an effective alternative to commercial sports drinks for recovery from intense bout of exercise. Water is vital for many chemical reactions that occur inside our cells, including the production of energy. When you sweat during exercise, you lose body water that can affect certain processes in your body. In addition, your blood becomes thicker if you don’t replace fluids. The result is a lower stroke volume (the amount of blood pumped by the heart per beat), cardiac output (the amount of blood pumped by the heart per minute) and ultimately a decreased oxygen delivery. The ability to exercise starts to decline. The best rehydration fluids are those that contain sodium, which stimulates the kidneys to retain water. However, if your workouts are at a low intensity and last less than an hour, plain water in combination with a balanced diet is just as effective. A good indicator of your hydration level is the colour of your urine, with a light color indicating sufficient hydration. On the other hand, if your urine appears cloudy and yellowish, you have to start drinking up! With hard training comes muscle damage and inflammation, which leads to muscle soreness. Try taking a cold bath after hard workouts to soothe the soreness. Since any physical activity you do during the rest of the day when you are not exercising will influence your rate of recovery, it is important that you limit your non-workout-related activity. For example, if you have just completed an intense weight training workout in the morning, it would not be wise to go for a long distance run the same afternoon. Planning your workouts properly with adequate recovery time in between will ensure that your performance don’t suffer during your next training session. When the training load is well planned and executed, your body will have the opportunity to recover and adapt to the exercise. You will also avoid over-training and significantly reduce your chances of getting an injury. So next time you finish a hard or long workout, drink some chocolate milk, take a cold bath, play around with your training work load, get more sleep instead of late night drinking sessions. These strategies will help to encourage optimal recovery in your quest for better endurance. For someone who is starting a fitness program or thinking of adopting a more active lifestyle after a long layoff, it is always a good idea to consult the doctor for advice and get a full physical assessment to rule out any underlying medical problems like cardiovascular disease, high blood pressure etc.